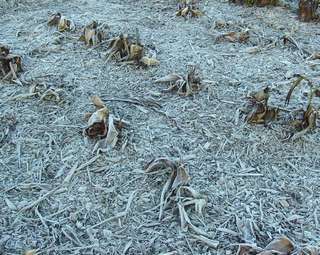 Ugly Frost damage on Cannas in winter will leave their leaves looking burnt; even a very light frost will leave behind a brownish mark on their foliage. Foliage growth on cannas will cease to grow anymore over a cold winter. 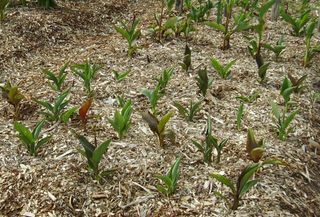 Cannas need warmth for above ground foliage to grow. These plants have been hit by frost a few times over; see how the leaves look more of a brown and crisp. New eye growth is constantly being produced on the underground rhizome during winter and this shoots away in early spring as the above ground temperature warm up. 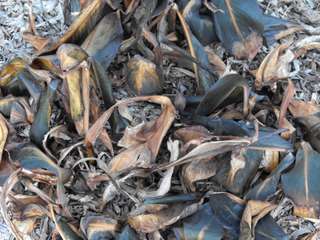 This is the result after only one heavy frost the leaves have turned a dark blackish tone and are soft and limp. 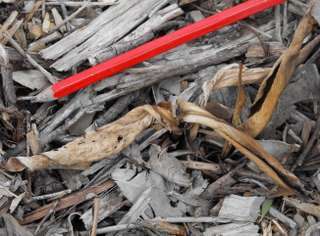 The dry brown stem in this picture is old growth that has naturally died back from the season before and the dry brown on some of the ends of the leaves is from the plants being very very dry and thirsty over a hot summer. 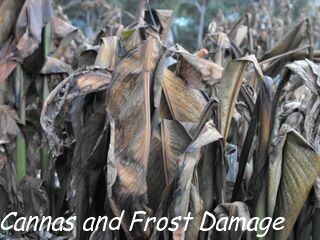 The young canna plants pictured here have been hit again and again by several heavy frost, some mornings it’s so cold and icy that the water in the hoses are frozen. A new seedling that was just starting to find its feet by sending up another shoot, then hit by a frost, I just leave them like this until the weather warms up again as there are more frost to come. Yippee, Spring in here, frost damage is gone after having their tiny foliage trimmed back. Look at the new growth they have made within a couple of weeks, unfortunately a week or so later there was a late frost and they got hit again, so they got another quick trimming back to the ground. In Snowy area's that experience heavy or extended periods of snow then you will have to seriously consider some cannas winter storage for your plants. Lift the whole clumps from the ground, trim back excess foliage to one foot or so, remove the bulk of the soil from the clump, usually a firm but gently bang on the ground will lodge off some excess dirt. Try to keep the clump together as a mass of rhizome, don’t break the clump up into individual rhizomes just yet keep them in a large clump, by being kept this way they are better insulated and will draw energy from the attaching rhizomes. Place them in large open topped bags for aeration and then store them in a warm frost free area over winter, garage or even under cover on a verandah would be fine, check every now and then and give a light watering if they really dry. If you have the room you could store them in your laundry, however as this being an inside room they may continue to grow with the additional warmth. When early spring arrives, divide them up into nice sizable divisions and replant, remember a bit of animal manure will ensure they get off to a good start. Personally I leave my canna rhizomes alone during winter and only when I think that the last frosty cold nights has past do I cut back the old frost damaged foliage. By doing it this way the burnt foliage is providing some protection for the shoots that had broken through the soil before winter, these shoots will now continue to grow and give some early canna flowers in the spring flower garden.